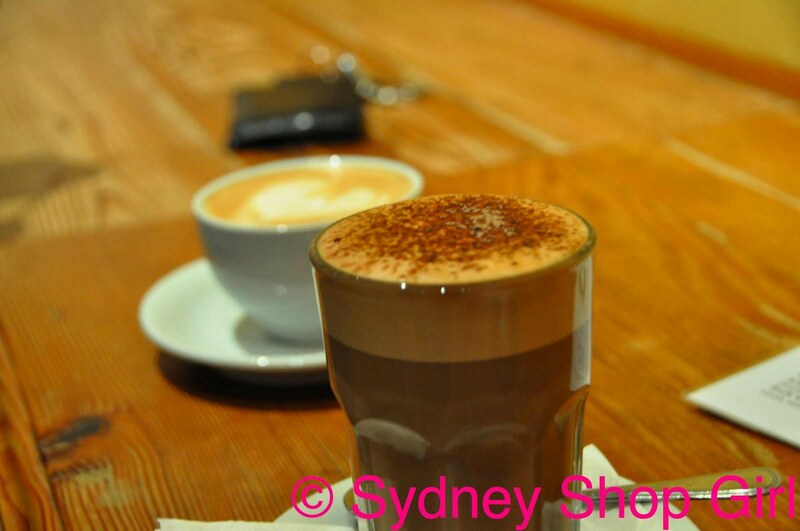 Sydney Shop Girl: Yoga With the Yoga Yodas. Brunch. Day 3 of Taking It Easy. Yoga With the Yoga Yodas. Brunch. Day 3 of Taking It Easy. The first Sunday of May. The weather has officially changed here in Sydney. It was foggy this morning and rather cool over night. It's going to be a different kind of week for me. I only have to work one and a half days. Then, I fly to Brisbane for a conference for the rest of the week in Coolum. The week after that? Annual leave. Couldn't have come at a better time. I need a bit of a break and a change of routine. This morning, Mr SSG and I were volunteer students for some Iyengar yoga teacher exams. There were 8 of us volunteers and 3 candidates. Each teacher took us through a 20 minute session. 3 - 4 poses which they demonstratated before then adjusting our attempts. Then, one person per class was assisted into a head stand and shoulder stand. As volunteers, we also had to take turns to have 'special conditions' - so that the candidates could demonstrate an ability to conduct a class where students need to do practice at different levels - which is how things are in a real class. It was a very unique experience. I now really appreciate the amount of training that our teachers undergo. There is so much more to teaching yoga than being technically close to perfect at the asanas. The ability to talk through asanas in a way the class can respond to is also a challenge. What I liked especially is how diverse our teachers are. I think a variety of ages, genders and life experiences really helps in teaching yoga. It is such a personal art to teach and each of us relate to different teachers in unique ways. I like the variety of being taught by different teachers. I've learnt so much from each of their slightly different techniques and emphasis. So, who are the yoga yodas? It's Mr SSG's nick name for the senior teachers who were examining today. They all looked like ordinary retirees but a few things gave them away - they radiated calmness and balance, they had perfect posture and they conducted the examinations whilst sitting on bolsters and folded blankets on the floor. No desks and chairs for them! It was reassuring though, that after the exams, the yodas were making plans to go on a coffee run. They are human after all. Taking the lead from the yodas, Mr SSG and I went in search of coffee and breakfast. Glebe Town Hall is in a quiet end of town so there weren't that many choices. We decided on digi.kaf - 174 St Johns Road, Glebe - tel: 9660 3509. As the name suggests, digi.kaf features an internet cafe on the second floor. 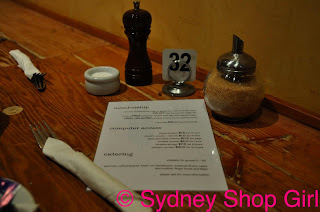 The decor was quite modern and the cafe spacious for the Inner West. 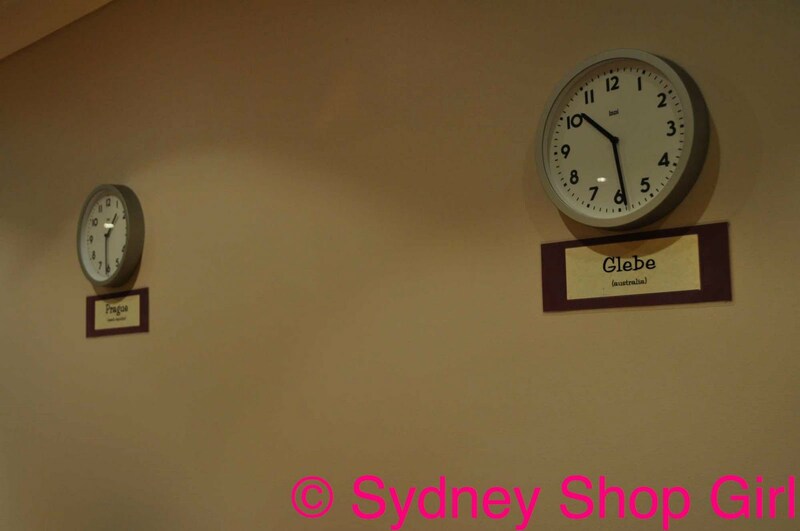 World time, with Glebe as the reference point. The drinks menu features rates for computer terminal hire on the reverse side. The second floor of the cafe is very spacious. 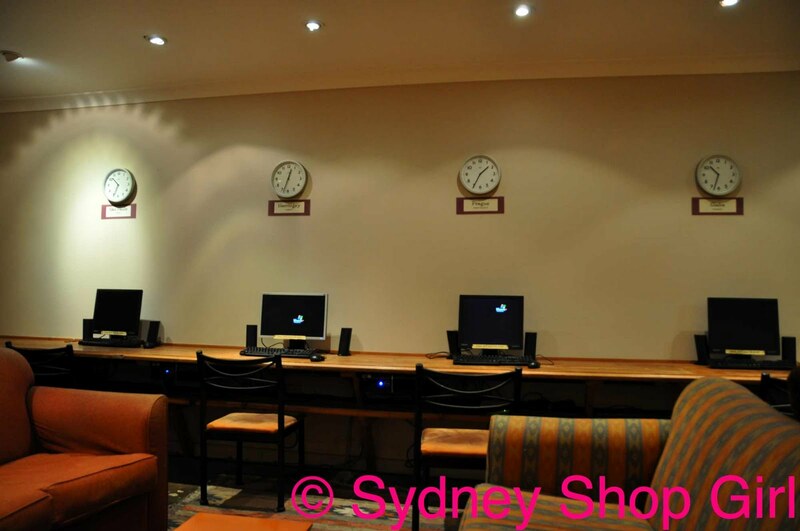 It's clearly an area loved by the local students from USyd. There were tutorials going on and students settled in for the day with their books and notes. Our hearty breakfasts arrived. Reasonably priced, fresh and of a generous size. Perfect for the target market. I had the stuffed potato pancakes with bacon and sour cream. 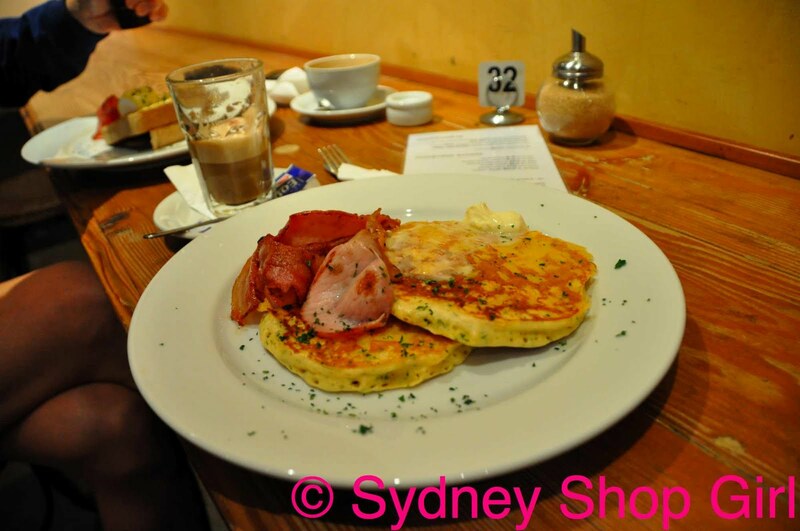 The pancakes, ordered to satisfy a craving triggered by Faux Fuchsia's recent blog post. I got in on the launch party fun from the comfort of my lounge room and lap top and now have a selection of Red Phoenix Emporium necklaces coming my way, including the FF necklace. Links and photos will be up in a future post. This is Mr SSG's left hand walking towards his Eggs Benedict. He's coming along to Coolum as well and will be the official social organizer whilst we are away. It's the third day of low activity and I'm starting to get cabin fever. I'm doing low key stuff like packing and tidying but it's just not - energetic enough? I'm actually pretty impressed I've lasted this long but the threat of burst stitches was enough to scare me into submission. I'm having a wardrobe crisis on account of my left foot. It doesn't look swollen but it is - it doesn't fit into any of my heels. I'm going to be in wide flats all this week. Which narrows the wardrobe options considerably. Have yet to test whether the foot fits into a leg of my skinny jeans. Just as well that I'll be barefoot and poolside for all the hours I'm not in the conference. OMG you got the FF Necklace? Am very jealous. Awaiting your review. :( Sad about your left foot, owies. Hope it gets better soon. I've got some egg sized bruise (lump) on my shin which i've managed to make go down with cold compresses. 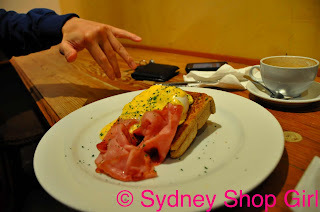 Semi Expat: yes, Australian breakfasts are great but British bicsuits... sigh. The foot is holding up. Maybe you could go all class and wear one heel and one thong, or a manky bandage over a bare foot. Though I don't think you're the type of girl to do that! Sorry to hear about your foot.. If you need any suggestions about what to do/great places to eat/shop at Coolum/Noosa (if you have any spare time), let me know. Is your conference at the Hyatt?